The children entering education in 2018 will be young adults in 2030. Schools can prepare them for jobs that have not yet been created, for technologies that have not yet been invented, to solve problems that have not yet been anticipated. It will be a shared responsibility to seize opportunities and find solutions. Children entering school in 2018 will need to abandon the notion that resources are limitless and are there to be exploited; they will need to value common prosperity, sustainability and well-being. They will need to be responsible and empowered, placing collaboration above division, and sustainability above short-term gain. But well-being involves more than access to material resources, such as income and wealth, jobs and earnings, and housing. It is also related to the quality of life, including health, civic engagement, social connections, education, security, life satisfaction and the environment. Equitable access to all of these underpins the concept of inclusive growth. Education needs to aim to do more than prepare young people for the world of work; it needs to equip students with the skills they need to become active, responsible and engaged citizens. Future-ready students need to exercise agency, in their own education and throughout life… Two factors, in particular, help learners enable agency. The first is a personalised learning environment that supports and motivates each student to nurture his or her passions, make connections between different learning experiences and opportunities, and design their own learning projects and processes in collaboration with others. The second is building a solid foundation: literacy and numeracy remain crucial. In the era of digital transformation and with the advent of big data, digital literacy and data literacy are becoming increasingly essential, as are physical health and mental well-being. Future-ready students will need both broad and specialised knowledge. Disciplinary knowledge will continue to be important, as the raw material from which new knowledge is developed, together with the capacity to think across the boundaries of disciplines and “connect the dots”. Epistemic knowledge, or knowledge about the disciplines, such as knowing how to think like a mathematician, historian or scientist, will also be significant, enabling students to extend their disciplinary knowledge. 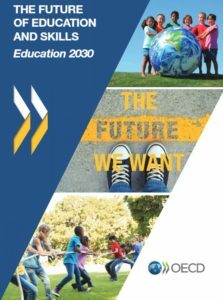 In its work across different countries, OECD Education 2030 has identified five common challenges. 1. Confronted with the needs and requests of parents, universities and employers, schools are dealing with curriculum overload. As a result, students often lack sufficient time to master key disciplinary concepts or, in the interests of a balanced life, to nurture friendships, to sleep and to exercise. It is time to shift the focus of our students from “more hours for learning” to “quality learning time”. 2. Curricula reforms suffer from time lags between recognition, decision making, implementation and impact. The gap between the intent of the curriculum and learning outcome is generally too wide. 3. Content must be of high quality if students are to engage in learning and acquire deeper understanding. 4. Curricula should ensure equity while innovating; all students, not just a select few, must benefit from social, economic and technological changes. 5. Careful planning and alignment is critically important for effective implementation of reforms. Click here to link to a PDF copy of the full report.